Since the year 2000, when the state-owned export credits foundation KredEx started issuing housing loan sureties, 13,640 young families, 7,300 young specialists and 69 people who lived in houses returned to lawful owners, i.e. over 21,000 households have improved their living conditions thanks to KredEx, LETA/Postimees Online reports. 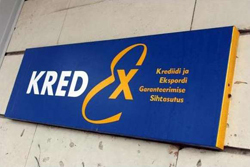 In 2010, banks issued 630.7 mln EEK or 40 mln EUR of housing loans with KredEx sureties. The volume of housing loans with KredEx sureties formed 10.4% of all housing loans issued last year. KredEx offers sureties to certain groups of population who then are not required to provide as high as usual self-financing share or guarantees themselves. As of the end of 2010, the KredEx housing sureties’ portfolio reached 559.4 million EEK or 35.7 million EUR. The average loan with KredEx surety was last year 729,000 EEK or 46,592 EUR.